The average UK household owned 7.4 internet devices*, in 2016. As our connectivity continues to grow, how is government managing increasing risks in cyber security? The Government’s security profession is helping tackle this by building skills across government and driving recruitment for a significant number of apprentices. The apprentices will help make a difference in government by protecting data and digital information from cyber crime, and by ensuring we have a strong talent pipeline for the future. Will Turnbull works for Civil Nuclear as a cyber security policy adviser. After leaving university he had a brief spell working as a commercial analyst for a large airline, before deciding to apply for the Civil Service Fast Stream programme. “I wanted a career that allowed me to help others and give back to society, and I found the Fast Stream model really appealing. Will originally intended on working for the Department of Energy and Climate Change (DECC), as he had a keen interest in energy generation and climate science. But after learning about government’s cyber security careers, he was pleased about his placement in a policy role at Civil Nuclear. “My new team were aware that I was joining from a non-cyber background and gave me a lot of time and support to get up to speed. 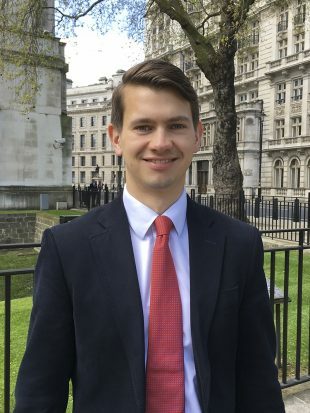 Early into his new post, Will was given the opportunity to learn from international experts, helping bring a new perspective to his understanding of cyber security. “I attended a workshop that was delivered as part of a commitment made at the US-UK Nuclear Security Summit in Washington, March 2016. As an emerging specialist and leader in cyber security, Will reflects on the challenges faced within his sector and in government. For those considering a role in cyber security, Will had a clear and encouraging message. “The digital age offers great opportunities, but also great risks. The importance of maintaining cyber security is only going to become more significant in the future. For more details about government’s cyber apprenticeship programme, visit Civil Service Jobs. What opportunities are there for degree-qualified computing professionals to move into the technical side of cyber security in government? For those with degrees in computing or digital, you can look at the Civil Service Jobs site for related roles. Government departments are in the process of developing their Cyber capability, and it might be the case that once in post, further specialised opportunities arise. Hi, will there be any more cyber security apprenticeships happening? This is something I'd really like to get into as cyber security is a very big interest of mine.